This screen allows to define project planning and follow progress. This screen offers many features that will be described in the next sections. Click on to validate planning. Click on to get a printable version of the Gantt chart. Click on to export planning to MS-Project xml format. Allows to display one baseline on top and one on bottom of the Gantt chart. Ability to display two baselines on the Gantt chart. Baseline can be saved with . The splitter is used to show or hide the progress data view. The progress data view is hidden by default. Move the splitter on your right to display them. The task list displayed planning elements in hierarchical form. Tasks are regrouped by project and activity. Projects displayed depends on selection done with the project selector. Click on or to adjust the hierarchical level displayed. An icon is displayed on the left of the corresponding element. Click on or on the group row to expand or shrink the group. Click on “Show WBS” to display the WBS number before the names. Click on a row will display the detail of the item in the detail window. Flag on «Show closed items» allows to list also closed items. The progress data view allows to show progress on project elements. For each planning element, the progress data are displayed at them right. The group row has a gray background. Used to display consolidated progress data for tasks. The task row has a white background. Used to display task progress data. Click on to define the columns displayed. Use checkboxes to select or unselect columns to display. Use the to reorder columns with drag & drop feature. The Gantt chart view is a graphic representation of progress data. For each planning element, a Gantt bar is displayed at them right. The Gantt chart view will be adjusted according to scale selected. Change the starting or ending date to limit the display of Gantt chart view. Save previous dates to retrieve them on every connection. Overdue tasks appear in red, others in green. The planning calculator tries to plan, the remaining work on the task assigned to a resource within the allocation to project period. 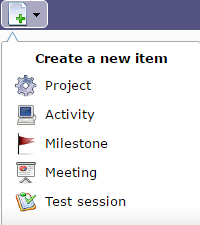 If remaining work on the task can’t be planned, a purple bar appears in the Gantt view. Displayed at group row level. Graphic display of consolidated dates for planning elements group. Start with the smallest start date and end with the biggest end date, either with planned or real dates. The line that cross a Gantt bar displays the percentage of actual progress. The length of the line represents the percentage of completion, based on the percentage of actual progress against the length of Gantt bar. Activities without assigned work are lighter bar, pale red or pale green as appropriate. Move the cursor over the bar to display item name and planned dates. Dependencies between planning elements are displayed with an arrow. Milestones appear as diamonds, filled if completed, empty if not. Color of diamond depends on milestone progress. Click on “Show resources” to display resources assigned to tasks. This parameter defines the option availability and whether the resource name or initial is displayed. Yellow column indicates the current day, week, month or quarter, according to scale selected. Red bar in yellow collumn display the current day and time. Right click on a bar to displays the detail of the work for this bar. You have to selected week or day scale to display detail or a message will ask you to switch to smaller scale. Project planning and activity planning calculation can be done in the Gantt. Allows to create a new planning element. The created element is added in the Gantt and detail window is opened. The detail window allows to complete entry. Planning elements can be managed with their own dedicated screen. Test session and Meeting elements can be added to the planning with their own dedicated screen. The selector allows to reorder the planning elements. Click on an element, the detail window will be displayed. Two new buttons are displayed in the header, they allow to increase or decrease indent of an element. The element will become the child of the previous element. The element will be moved at the same level than the previous element. To create a dependency link, clicked and hold on a graphic element, the mouse cursor changes to . Move mouse cursor on graphic element that will be linked and release the button. Dependency links can be managed in element screen. See: Predecessor and Sucessor element sections. Click on to start the activity planning calculation. Check the box to activate automatic calculation on each change. Allows to store planned dates into requested and validated dates. In other words, this feature allows to set baseline dates and preliminary dates from calculated planning. Always: Always overwrite existing values. If empty: Store only if the value is empty. Never: Values are not stored. This screen displays Gantt chart from projects portfolio point of view. It displays projects synthesis and project’s dependencies, without project activities. This section describes specific behavior for this screen. All others behaviors are similar to Planning screen. It is possible to define whether milestones are displayed or not. If they are displayed, then It is possible to define the type of milestone to be displayed or displayed all. This screen displays Gantt chart from the resources point of view. 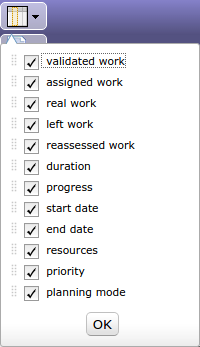 Assigned tasks are grouped under resource level. This makes appear some planning gap between started work and reassessed work. Links between activities are displayed only in the resource group. Links existing between tasks on different resources are not displayed. Tasks can be grouped by project. Click on “Show project level” to display project level. Left work can be displayed at right from Gantt bar. Click on “Show left work” to display left work for each item. Click and select one ressource to display only his data. Click and select one team to display only data of resources of this team. Allows to export planning to PDF format. Export contains all details and links between tasks. Zoom Allows to fit planning on page. Repeat headers Planning can be span multiple pages. This new feature will execute export on client side, in your browser. Thus the server will not be heavy loaded like standard PDF export does. It is highly faster than standard PDF export. Therefore, this feature is hightly dependant to browser compatibility. This new feature is technically complex and it is not compatible with all browsers. Enabled only with Chrome browser as of now. Else, the old export feature will be used. To enable this feature for all browsers, add the parameter $pdfPlanningBeta=’true’; in parameters.php file.